I LOVE lime and coconut – both the flavors to eat and the scents to enjoy. 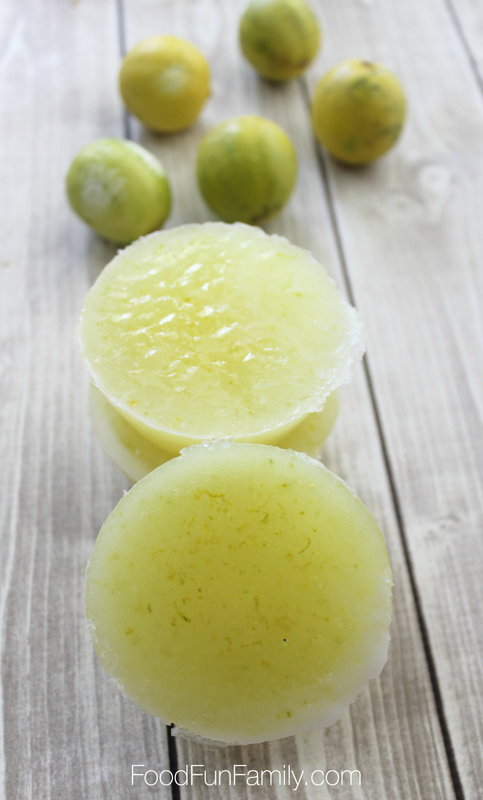 I know you’ll love these lime and coconut sugar scrub bars! Note that the links to point you to the ingredients needed to make this DIY bath & beauty product are affiliate links, which means I can make a few a little bit of change when you purchase them. You never have to pay more (and often I have insider info on deals and sales!). 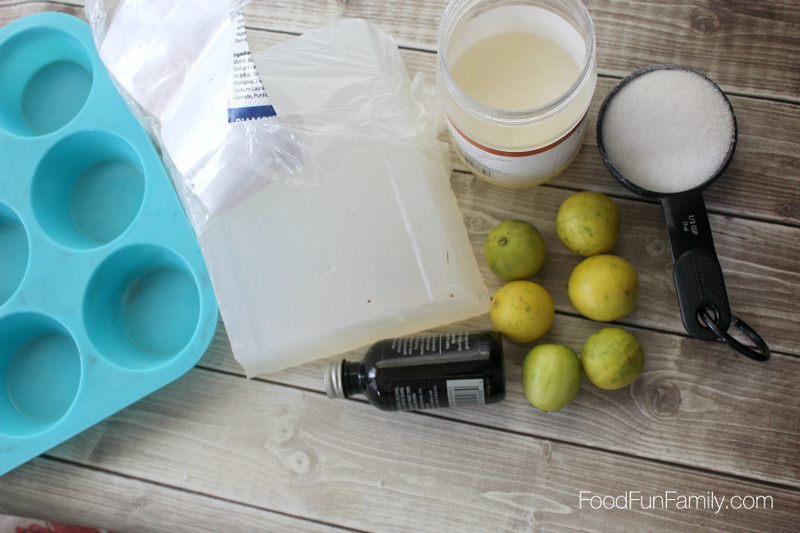 Have fun making these sugar scrub bars! Every excuse I get to use my essential oils and other natural products finds me creating a new DIY beauty recipe to enjoy. 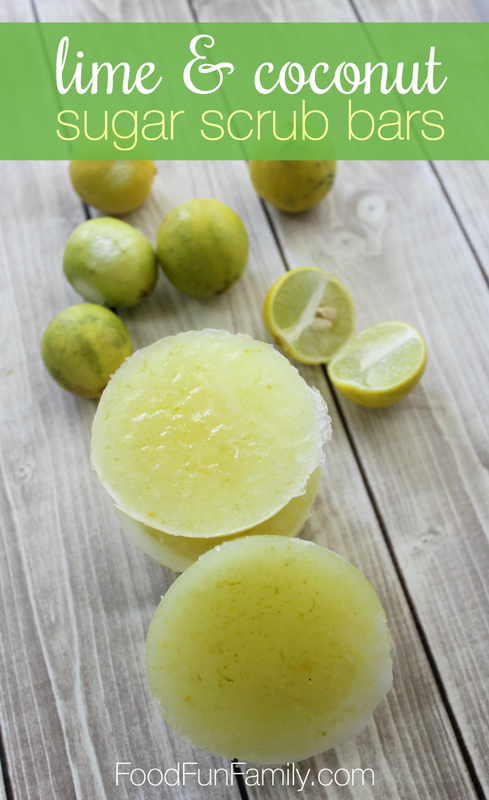 Whether you are in the middle of summer or in the cold blustery depths of winter, you can enjoy these bright, fresh-scented Lime & Coconut Sugar Scrub Bars. They exfoliate away dry skin, leaving it soft and moisturized, while treating your nose to a delicious light scent that perks you up. I had to do it. I mean..who doesn’t have the lime in the coconut song stuck in their heads already? 1. Chop soap base into small 1” pieces to measure them out; this recipe does not require that you be precise…a general measurement is sufficient. 2. Place soap base in a small pot over medium heat, stirring frequently until completely melted. 3. 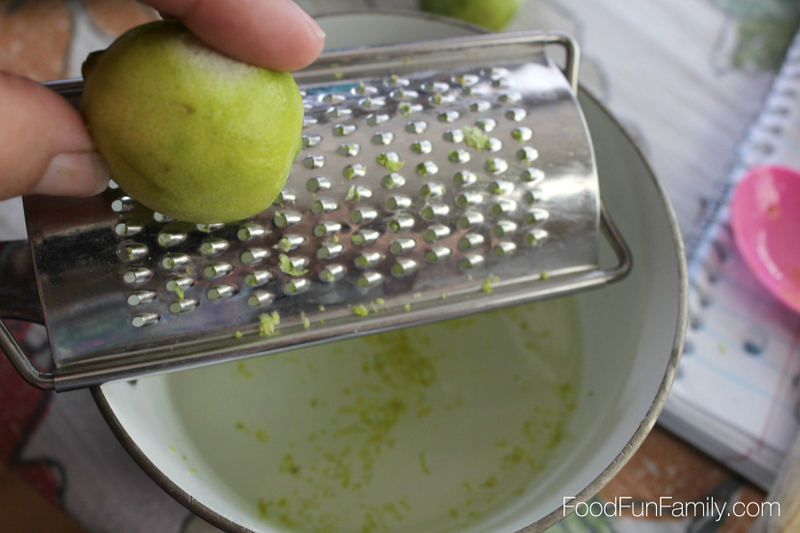 Remove from heat and stir in coconut oil, sugar, coconut extract, lime essential oil, and lime zest; stir to combine well. 4. 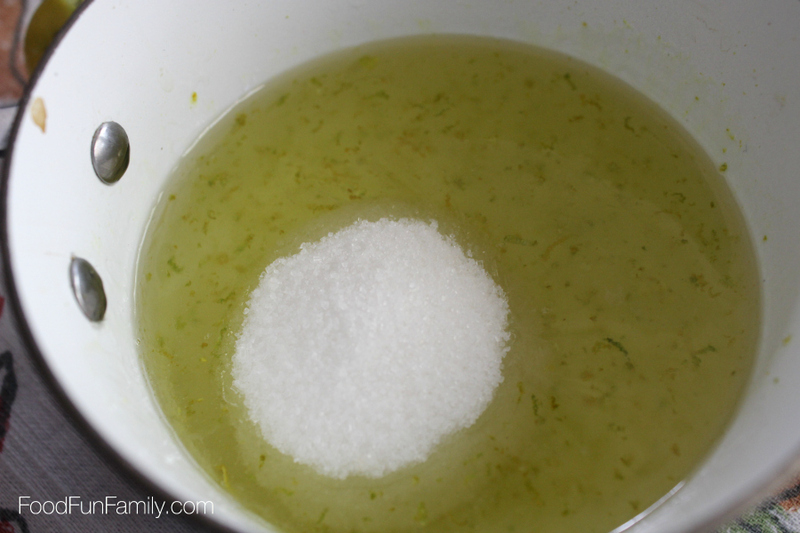 Quickly pour into mold; stir gently with a toothpick to remove air bubbles. 5. Allow mold to sit until completely cool and set for 4 to 5 hours. 6. 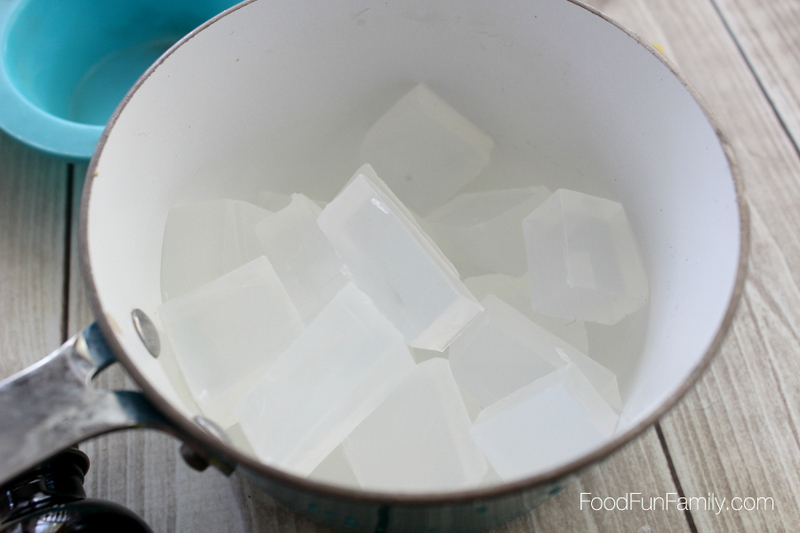 Remove sugar scrub bars from mold and store in a cool dry place. To use: Apply to wet skin in a circular motion, rinse away, pat skin dry. These luxurious Coconut & Lime Sugar Scrub Bars are a special treat you can make yourself or they make a fantastic handmade gift for anytime of year. Pop them in a glass jar, add a pretty bow and a handmade tag, and you’re in business! This particular scrub is a light exfoliator, but you can adjust the coarseness with the ingredients you use (ie, use a coarse sugar or even salt in place of a fine grain sugar or salt). This sounds amazingly refreshing! Thanks for the idea. We tried to double this recipe and the results were not liquid enough to pour into molds. We had to pack them in and then refrigerate to get them to solidify. Do you think we didn’t use enough soap? Do you need any sort of perservative with the lime zest in there?? How many you make depends on the size of the molds you use. The “unmolded” product is about 2 cups, so you’d just divide that amount by the capacity of your molds. Hope that helps! I’m planning on making these as Christmas gifts and putting them into the 1/2 cup canning jars. Do you think I could pack the mixture directly in the jar for the recipient to tap out and use later, or do they need to be in silicone molds first so they don’t stick to the glass? I would think it would be fine to just make it in mason jars and then scooping out some to use each time (that’s what I often do for sugar scrubs, instead of making them into bars). You may just want to add more dry ingredients or less wet ingredients to make it the right consistency, if that makes sense. I love this recipe! Great twist to something simple. Thanks for the post. I bet these smell fantastic! Thanks for linking up at Welcome Home Wednesdays! Ah, what a perfect summer scent!! I’ve been wanting to make a sugar scrub, and this sounds absolutely awesome-so I’m totally going to give it a try (: Thanks so much for sharing!! I bet these smell wonderful. We’ve been getting into homemade soaps & scrubs, so I want to give this a try. Thanks for sharing on Merry Monday. Thank you for sharing this recipe with us. It looks like a great thing to have on hand. Well, I need this in my life ASAP. I bet it smells AMAZING! These scrub bars look so pretty and I bet they smell great. I want to make these to use for a body scrub. I love making homemade beauty items. Lime and coconut are two of my favorite things! I cant wait to try this! I love lime and coconut scents. I can’t wait to make these. Thanks for sharing. You’re welcome! They’ve always been a favorite of mine, too!